This course covers the application of the tangible personal property regulations that were finalized in 2013 and 2014. The concept of "unit of property" is addressed, as are the types of acquisition and production costs that must be capitalized. Of primary concern is distinguishing deductible repairs from improvements that must be capitalized, and to this end the capitalization categories of betterments, adaptations, and restorations are fully described. The course also provides practical guidance on the procedures for making accounting method changes, especially those that are required to conform to the final regulations. A table indicating the most common accounting method changes, their assigned change numbers, and legal source will assist practitioners in preparing Form 3115, Application for Change in Accounting Method. In addition, each of the important elections that are available under the new rules is discussed in detail. Calculating the adjustments to income that may be required by an accounting method change is covered, as is the use of general asset accounts. Distinguish deductible repairs from improvement costs that must be capitalized. Identify the accounting options available for materials and supplies and spare parts. 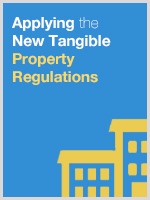 Determine what constitutes a unit of property under the final regulations. Select the appropriate elections available under the final regulations. Identify the various safe harbors provided by the final regulations. Calculate Code section 481(a) adjustments. Recognize circumstances in which general asset accounts may still be beneficial.